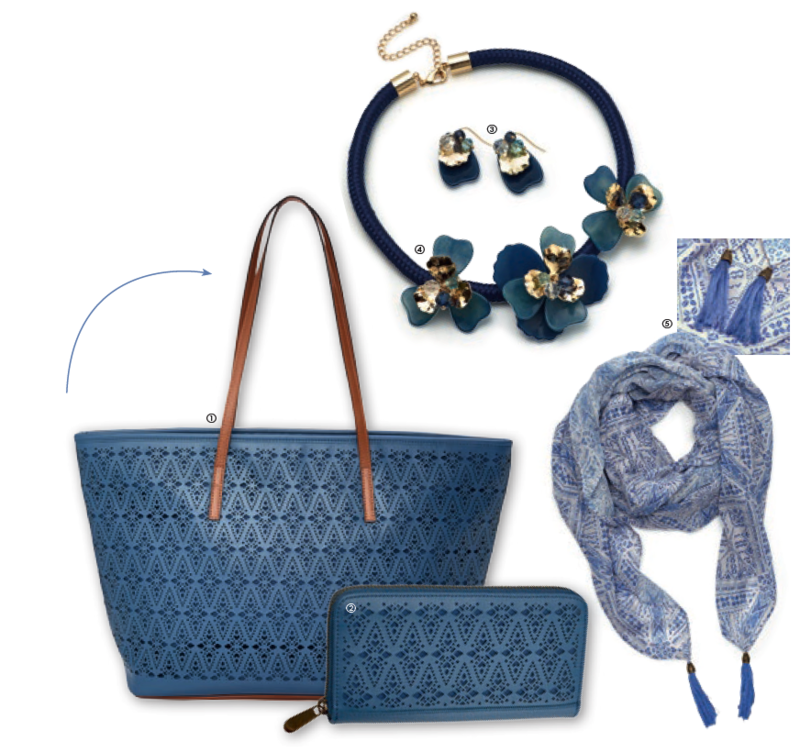 Take a trip through the Mediterranean with this romantic Oriflame collection in a stunning blue and “lace” design. Elegant leather imitation leather case with laser cut in a chic Mediterranean blue and brown base and straps. Lined interior, zip, open pockets and zip pocket inside. Details: Romantic and trendy, “lace” design, zip, zippered pocket, open pockets. Dimensions: 32 x 14.5 x 26.5 cm. Fantastic portfolio in imitation leather, with lace design, in a Mediterranean blue tone and zipper. Lined interior and coin compartment with zipper, 2 compartments for notes and spaces for 8 cards. Dimensions: 19.5 x 2.5 x 10 cm. scarf Wonderful cotton polyester scarf with geometric design in shades of blue and a tassel at each end. Dimensions: 110 x 110cm; Tassel length 8 cm. necklace Fabulous floral necklace. Flowers with polyresin petals in blues and golds, with faceted glass beads. Lobster clasp and extension chain. Sent in an organza bag. Dimensions: length 45 cm + 6 cm extension. Nickel tested. Earrings Earrings with petals in blue and gold polyresin, with faceted glass beads. Golden hook. Sent in an organza bag. Dimensions: length 4.5 cm. Nickel tested.